I am neither an author nor a scholar…just a grandmother and a Bible class teacher, so my blog will be neither scholarly nor a great literary work. However, I hope to write entries in my blog while we are on this trip so family at home (grandchildren in particular…along with the students in my fifth grade Bible Class, and the group of teenage girls I lovingly refer to as the “Salt Shakers”) can keep up with where I am, and what I am seeing and learning. Jane and Olen have been on several of my tours, and she is always one of the best prepared to learn. Both of them are good photographers. 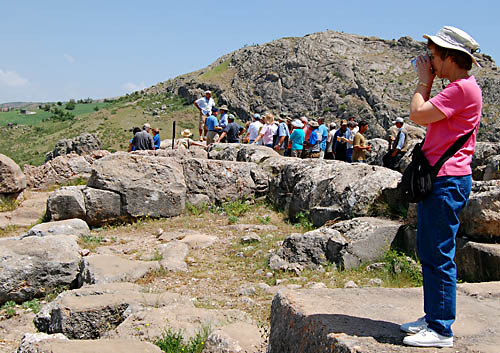 Here is a photo of Jane among the Hittite ruins at ancient Hattusas in Turkey. If you have children, grandchildren, or if you teach a class of young people, I am sure you will enjoy Jane’s posts. Click here to go to journeyswithjane.blogspot.com.